Middlesex University works hard to ensure that online student services are available 24/7. However, occasionally there may be some disruption as we carry out essential maintenance or introduce improvements. Unplanned disruption to services may also occur, and we take these issues very seriously. If this happens, we will let you know as soon as possible in the service status pages and through a variety of other communication channels including social media and digital signage. In all cases, we work very hard to ensure that disruption is kept to a minimum and normal service is resumed as soon as possible. As part of University’s IT improvements works and in order to provide you with computers in a good working state, we will carry out daily maintenance on them at the following times. Please note that you will always be notified of the imminent shutdown. Please ensure you save your work at all times, as your work will be lost once the computers are restarted. When accessing some links in myUniHub you will be prompted with the following login box to access the Students Records System. Please login with your IT User ID and password. Some emails may appear to come from a known person like a tutor or another staff, please be extra vigilant when responding to emails. While we try to block as much spam as possible, as with any of your inboxes, some still annoyingly slips through. Hover the cursor over any link embedded in the email to see if the address is valid and do not click unless certain the email is from a trusted source. If the sender appears to be asking you to click a link you are uncertain about – call or email them to check before you follow the link. If the email is marked as SPAM, this is because at some point it has come from a non-Middlesex email address. Any email marked with a SPAM should be considered as suspicious. Please be aware, Middlesex University staff will never ask for your account details, if you are ever prompted to supply these details, please delete the email. If you’re still using your default password given to you when you enrolled, you must change your password at next logon. This is in order to protect your work and personal data. 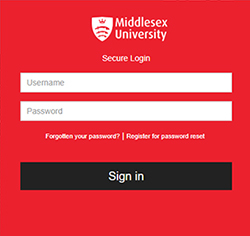 Each year Middlesex University updates myUniHub, MDXapp and the Student Records System to improve the functionality and performance of the University’s online student services. We work hard to ensure this disruption is kept to a minimum and will keep you updated as this work takes place. For more details about these improvements please visit our Project Page. Please note that myUniHub is unavailable each evening from midnight to 1am (UK Time) for necessary backup. We apologise for any inconvenience caused by this essential maintenance. Alternatively you may also access your emails by setting them up on your Android or Apple IOS mobile device. Library e-resources (journals, eBooks, databases etc.) can be accessed using the direct links below.